Do you overeat during times of stress? Do you often find yourself eating when you're not even hungry? The Intuitive Eating Workbook offers a new way of looking at food. Based on the best-selling book, Intuitive Eating, this comprehensive workbook addresses the ten principles of intuitive eating, and provides an evidence-based model to help readers develop a healthy relationship with food, pay attention to cues of hunger and satisfaction, and cultivate a profound connection with both mind and body. Do you use food to comfort yourself during stressful times? The Intuitive Eating Workbook offers a comprehensive, evidence-based program to help you develop a healthy relationship with food, pay attention to cues of hunger and satisfaction, and cultivate a profound connection with your mind and body. Have you tried fad diet after fad diet, only to gain weight back? Maybe you've tried the protein diet only to move on to vegetables only? Raw almonds and coconut water every forty-five minutes instead of big meals? Or perhaps you've tried counting calories, but the numbers on the scale still don't add up. If you are ready to throw in your hat and give up on dieting for good, take heart. You can enjoy food again-you just need to pay attention to your body's natural hunger cues. 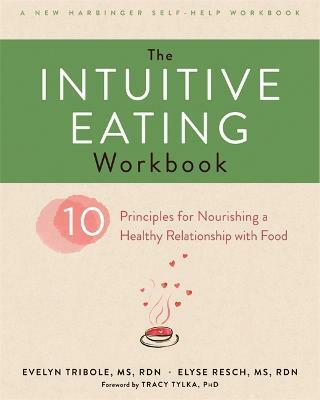 Based on the authors' best-selling book, Intuitive Eating, this workbook can show you how. The Intuitive Eating Workbook offers a new way of looking at food and mealtime by showing you how to recognize your body's natural hunger signals. Structured around the ten principles of intuitive eating, the mindful approach in this workbook encourages you to abandon unhealthy weight control behaviors, develop positive body image, and-most importantly-stop feeling distressed around food! You were born with all the wisdom you need for eating intuitively. This book will help you reconnect with that wisdom and ultimately change your life-one meal at a time. "Recovery from stress eating and body shame isn't about becoming a new person; it's a process that takes you back to the healthy, safe place you once knew as a child, before dreams of happiness through weight loss made you lose your way. The Intuitive Eating Workbook breaks down a potentially scary journey into practical, even enjoyable, steps. It's like you're on the yellow brick road, and Tribole and Resch are your ever-supportive sidekicks, warning you of pitfalls and boosting you when you struggle. Add in a catchy tune, and find your way back to where you always belonged." --Jessica Setnick, MS, RD, CEDRD, author of The Eating Disorders Clinical Pocket Guide and Eating Disorders Boot Camp, and cofounder of the International Federation of Eating Disorder Dietitians "The Intuitive Eating Workbook is the perfect must-read, must-experience, and must-use supplement to Evelyn and Elyse's game-changing book, Intuitive Eating. The workbook models a dialect of compassion that makes each exercise accessible and--pun intended--digestible for all. The Intuitive Eating Workbook is The Artist's Way of health, offering keys to long-term, sustainable self-care, recognizing that eating is bigger than simply food itself. As Evelyn and Elyse say in the workbook, 'You are the expert of your own body, ' an obvious and still radical notion that can both enhance our own lives, and also change the world at large." --Caroline Rothstein, MS, writer, performer, activist, and educator "Intuitive eating is both revolutionary and utterly logical. This is an invaluable guide to anyone who has ever struggled with food. In fact, I believe anyone would benefit from utilizing this resource as it directly challenges both our individual food issues, and those endemic to our culture. This is the end of dieting, for everyone." --Kelsey Miller, author of Big Girl "Evelyn Tribole and Elyse Resch's The Intuitive Eating Workbook is a must-have for anyone who wants to improve their relationship with food! Its practical, easy-to-read format walks you step-by-step through the process of learning to use your internal wisdom to enjoy eating food in a peaceful, healthy way. A fantastic resource for health care professionals." --Susan Albers, psychologist and New York Times bestselling author of EatQ, Eating Mindfully, and 50 Ways to Soothe Yourself Without Food "From the dangers of dieting and weight cycling to learning body respect and total self-care, this workbook covers all the bases of intuitive eating for both novices and those who need a bit more help along the way. Although dieticians generally teach us the 'what' of eating, Tribole and Resch write about the 'why' and 'how' of it as well as any seasoned eating disorders therapists." --Karen R. Koenig, MEd, LCSW, author of The Food and Feelings Workbook and six other books on eating "Evelyn and Elyse have done it again! I highly recommend The Intuitive Eating Workbook. Full freedom from food and body image problems is absolutely possible." --Jenni Schaefer, author of Goodbye Ed, Hello Me; Life Without Ed; and coauthor of Almost Anorexic "With The Intuitive Eating Workbook, Tribole and Resch have created an empowering resource, not only for those who wish to embrace and practice intuitive eating, but also for health care professionals seeking to provide support. The Intuitive Eating Workbook provides a concise review of the foundational principles with references to supporting research and thoughtful exercises designed to promote attunement, self-care, and body appreciation. Tribole and Resch infuse each page with compassion and the unique perspective of their combined professional experience, making this a welcome healing tool for laypersons and professionals alike." --Paige O'Mahoney, MD, CHWC, coauthor of Helping Patients Outsmart Overeating, certified Intuitive Eating counselor, and founder of Deliberate Life Wellness, LLC "The Intuitive Eating Workbook takes the wisdom of intuitive eating to a practical, informative self-help format. It is a perfect stand-alone workbook, as well as a supportive tool for work with patients. With activities that build resilience from a steady base of self-care, positive embodiment, and understanding, this book makes a deeper connection with your body and a healthier relationship with food completely accessible." --Catherine Cook-Cottone, PhD, associate professor, licensed psychologist, and author of Mindfulness and Yoga for Self-Regulation "The Intuitive Eating Workbook, written by Health at Every Size advocates Evelyn Tribole and Elyse Resch, is an invaluable tool on your journey to developing a peaceful and satisfying relationship with food, mind, and body. It explains the principles of intuitive eating in a clear and inviting way, and offers a wealth of thought-provoking and effective exercises that help readers tune into their bodies' signals, and challenge distorted thoughts about food and body. This book will be a treasured resource for the general public and for health professionals as well." --Linda Bacon, PhD, author of Body Respect and Health at Every Size "This is not just another book about dieting, but rather a simple ten-step approach to improve the relationship between food and one's mind, body, and soul! The book promotes the principles that will maximize psychological and physical health to improve quantity and quality of life--something that I have promoted and written about for the past thirty-five years. This work should prove to be extremely helpful to many patients, including my own, and to the general public. I highly recommend it!" Evelyn Tribole, MS, RDN, is an award-winning registered dietitian with a nutrition counseling practice in Newport Beach, California, specializing in eating disorders. She also trains health professionals on how to help their clients cultivate a healthy relationship with food, mind, and body through the process of Intuitive Eating, a concept she co-pioneered. Tribole is author of several books, including Healthy Homestyle Cooking, and is coauthor of Intuitive Eating. She was the nutrition expert for Good Morning America and was a national spokesperson for the Academy of Nutrition and Dietetics for six years. She served three years on the Social Media committee of the Academy for Eating Disorders. Tribole is often sought after by the media for her nutritional expertise and has appeared in hundreds of interviews, including: CNN, NBC's Today Show, MSNBC, Fox News, USA Today, The Wall Street Journal and People magazine. She also gives presentations around the world on intuitive eating. Elyse Resch, MS, RDN, CEDRD, FAND, is a nutrition therapist in private practice in Beverly Hills with over thirty-five years of experience specializing in eating disorders, intuitive eating, and health at every size. She is coauthor of Intuitive Eating, has published journal articles, and does regular speaking engagements and extensive media interviews. Her work has been profiled on CNN, KABC, NBC, AP Press KFI Radio, USA Today, KTTV television, among other. Resch is nationally known for her work in helping patients break free from the diet mentality through the intuitive eating process. Her philosophy embraces the goal of reconnecting with your internal wisdom about eating. She supervises and trains health professionals, is a certified child and adolescent obesity expert, a Certified Eating Disorder Registered Dietitian, and a Fellow of the International Association of Eating Disorder Professionals, and a Fellow of the Academy of Nutrition and Dietetics.